The Keyboard Corporation has, from its very beginnings in 1978, been a specialized transporter of high value, relatively heavy, and easily blemished products; such as pianos and organs from the manufacturer / distributor to their dealer network. At the beginning of the new millennium, a chance meeting between the President of Keyboard and an Indian Motorcycle dealer led to the development of a unique delivery system for the Motorcycle Industry. Keyboard’s President, listened as the dealer described the difficulties he experienced in getting delivery of motorcycles from Indian’s plant in Gilroy, CA to his dealership in Kentucky. Deliveries often took weeks and when they finally did arrive; the motorcycles often required expensive and time consuming prep work before they could be seen on the showroom floor. Dennis developed, from scratch, a completely new platform to be used exclusively in the delivery of uncrated motorcycles. The first 100 of these were fabricated internally (each platform has over one hundred metal parts) and the first load of motorcycles was picked up in Gilroy and delivered to the dealerships personally by Keyboard’s President. Within three months, Keyboard was the exclusive carrier of Indian Motorcycles. Although Indian subsequently went bankrupt, their dealers had seen the Keyboard system and had begun spreading the good word. The following year Keyboard was selected by more than 30 different specialty motorcycle manufacturers as their preferred carrier. 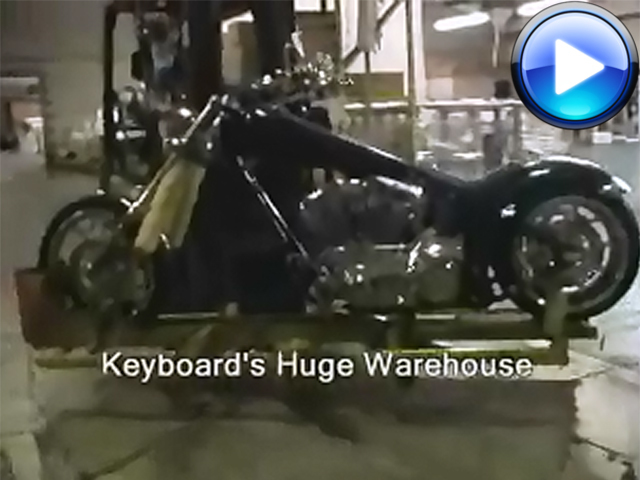 Today Keyboard is a major supplier of logistics services to the motorcycle industry and the leading provider of transportation services for uncrated motorcycles thanks in large part to Dennis’s dedication to problem solving and the resulting patented delivery platform.